Home > Customer Reviews > No Gimmicks! 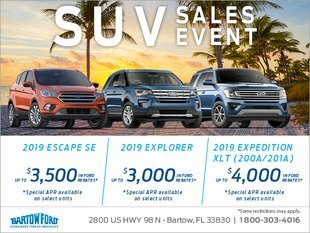 If you are looking for honesty and a great service go to Bartow Ford! No gimmicks! I had a great experience at Bartow Ford. It lived up to every good thing I'd heard about the dealership. I was assisted by Dylan, who was very helpful and kind. He worked hard for several days to find just the right car for me, and even stayed late to close the deal once I'd decided on one. I really appreciate his efforts because I ended up with a beautiful car that exceeded my expectations. I would absolutely recommend both him and Bartow Ford itself to anyone seeking a vehicle. Thank you! Chris Stricker was great. I would buy from him again. I have bought vehicles from Bartow for the past 30 years. Great service and sales people. Thanks for the great experience.